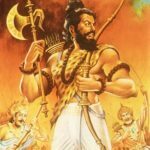 similarities between Hinduism and Greek mythology? There are many similarities among different mythical characters of different epics. I dont know whether they are same or related to each other. Same thing is there in Mahabharata and Trojan war. 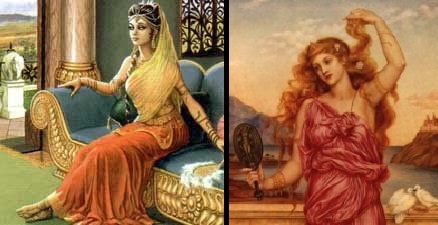 I wonder if our mythology is influenced by theirs or theirs by ours! I guess we used to live in the same area and now we had different versions of same epic. Here I have compared some of the characters and I tell you this is very interesting. 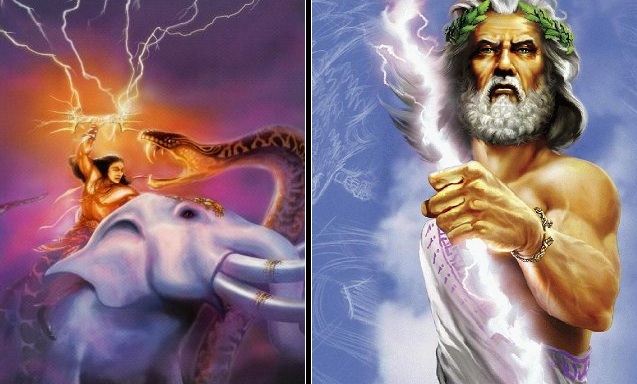 Zeus, the God of rains and thunder is the most worshipped God in Greek Pantheon. He is the king of Gods. He carries with himself a thunderbolt.Indra is the God of rains and thunder and he too carries a thunderbolt called Vajra. He is also the king of Gods. Hades and Yamraj : Hades is the God of the netherworld and death. A similar role is carried by Yama in the Indian Mythology. 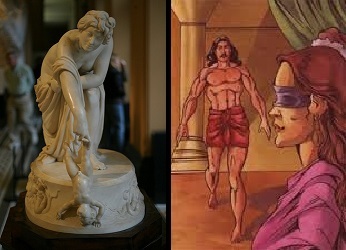 Achilles and Lord Krishna: I think Krishna and Achilles both were the same. 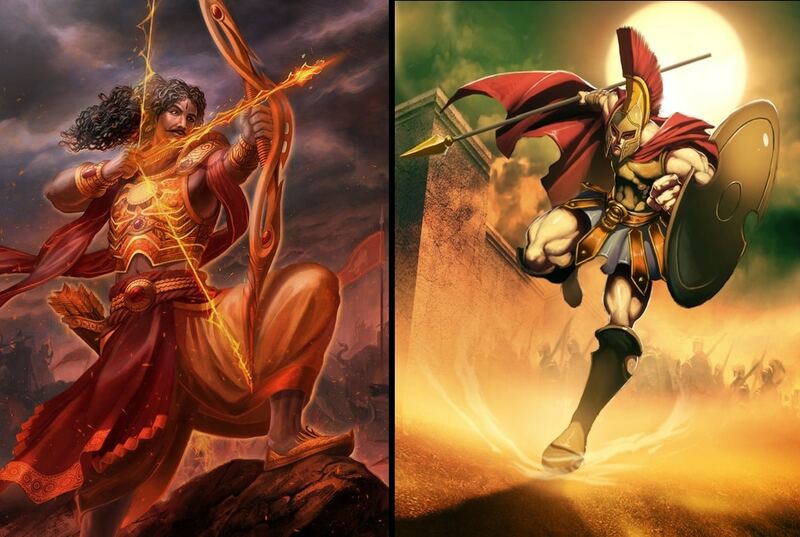 Both were killed by an arrow piercing their heel and both are the heroes of the two of the world’s greatest epics. 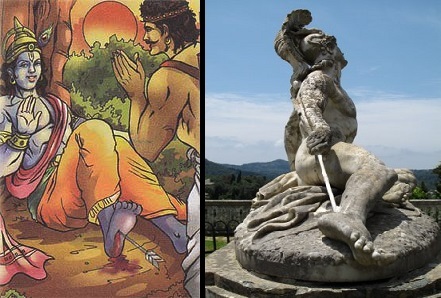 Achilles heels and Krishna’s heels were the only vulnerable point on their bodies and the reason of their deaths. Krishna dies when Jara’s arrow pierces his heel. Achilles death was caused by an arrow in his heel too. 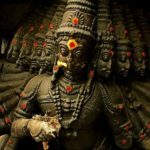 Atlantis and Dwarka: Atlantis is a legendary island. It is said that after a failed attempt to invade Athens, Atlantis sank into the ocean “in a single day and night of misfortune.” In Hindu Mythology, Dwarka, a city built by Vishwakarma on the order of Lord Krishna is supposed to have suffered a similar fate of submersion into the sea after a war among the Yadavas, the descendants of Lord Krishna. Karna and Achilles: Karna’s kawach (armour) has been compared with that of Achilles’s Styx-coated body. He has been compared to the Greek character Achilles on various occasions as they both have powers but lack status. Krishna and Odysseus: It is the character of Odysseus that is a lot more like Krishna. He convinces a reluctant Achilles to fight for Agamemnon – a war the Greek hero did not want to fight. Krishna did the same with Arjuna. Duryodhana and Achilles: Achilles mother, Thetis, had dipped the infant Achilles in the river Styx, holding him by his heel and he became invincible where the waters touched him—that is, everywhere but the areas covered by her thumb and forefinger, implying that only a heel wound could have been his downfall and as anyone could have predicted he was killed when an arrow shot by Paris and guided by Apollo punctures his heel. Similarly, in Mahabharata, Gandhari decides to help Duryodhana triumph. Asking him to bathe and enter her tent naked, she prepares to use the great mystic power of her eyes, blind-folded for many years out of respect for her blind husband, to make his body invincible to all attack in every portion. But when Krishna, who is returning after paying the queen a visit, runs into a naked Duryodhana coming to the pavilion, he mockingly rebukes him for his intention to emerge so before his own mother. Knowing of Gandhari’s intentions, Krishna criticizes Duryodhana, who sheepishly covers his groin before entering the tent. When Gandhari’s eyes fall upon Duryodhana, they mystically make each part of his body invincible. She is shocked to see that Duryodhana had covered his groin, which was thus not protected by her mystic power. In Greek mythology, Helen of Troy has always been projected as a seductress who eloped with young Paris, forcing her despairing husband to fight the war of Troy to get her back. This war resulted in the burning of the beautiful city. Helen was held accountable for this annihilation. We also hear of Draupadi being blamed for Mahabharata. 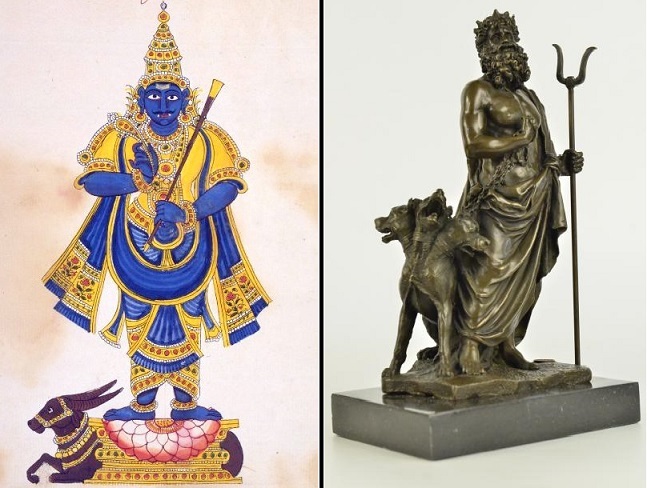 Brahma and Zeus: We have Brahma changing into a swan to seduce Saraswati, and Greek mythology has Zeus changing himself into many forms (including a swan) to seduce Leda. Both were both forcibly abducted and wooed, and both (in different circumstances) disappeared under the Earth. Arjuna and Achilees: When the war starts out, Arjuna is unwilling to fight. Similarly, when the Trojan War starts, Achilees does not want to fight. The lamentations of Achilles over the dead body of Patroclus are similar to lamentations of Arjuna over the dead body of his son Abhimanyu. Arjuna laments over the dead body of his son Abhimanyu and pledges to kill Jaydrath the following day. Achilles laments on the dead pody of his brother Patroculus, and pledges to kill Hector the following day. Draupadi, although loves Arjuna, begins to have a soft corner for Karna. Helen, although loves Paris, begins to have a soft corner for Hector, for she knows that Paris is useless and not respected while Hector is the warrior and well respected. 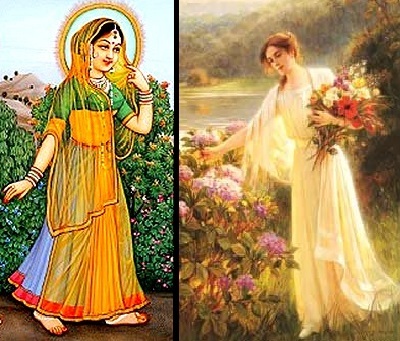 Please do read our Next post “What are the similarities between Hinduism and Greek mythology? Part 2” to continue reading.